Haven't splashed the cash on a 4K monitor yet? 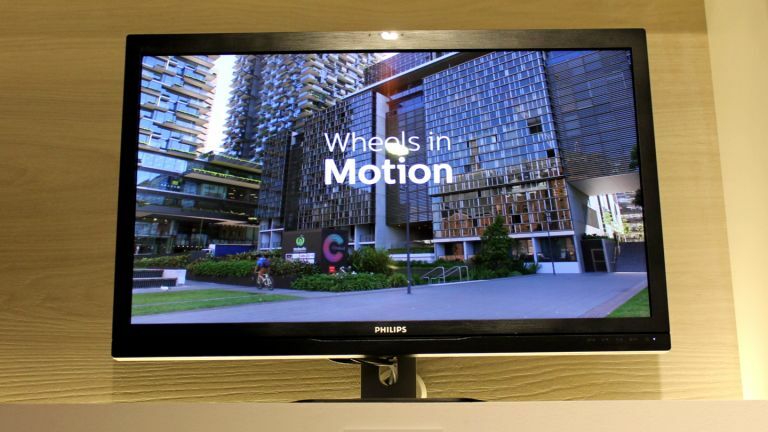 After laying eyes on a 5K monitor like Philips's 275P4VYKEB, you might not want to. 4K marked huge leap in quality from 1080p, but for multimedia-editing professionals and anyone who likes having a spacious desktop to be productive, 5K is much more exciting. Philips's new model isn't the first 5K monitor - that honour belongs to Dell's UP2715K that launched in late 2014. Apple followed shortly after with the iMac with Retina 5K display, a beautiful machine that combined the convenience of an all-in-one with a jaw dropping 5,120 x 2,880 pixel-resolution display. All three models remain a threat to your wallet's blood pressure, though considering the cost of Dell's model (£1,100) and the 275P4VYKEB (around 1400 Euros - or £1,020 - when it goes on sale later this year), the iMac with 5K Retina Display (£1,599) seems good value. On show at IFA 2015, Philips wouldn't let us actually touch the 275P4VYKEB, which sat on a ledge about eight feet up a wall. As such, this is more of an "eyes-on" than a "hands-on" review. My eyes liked what they saw. The 5K demo video running on the 275P4VYKEB looked crisp and detailed even though it was quite far away (compared to sat on a normal desk, anyway). The monitor boasts a pixel-resolution of 5,120 x 2,880, matching Dell's model and Apple's Retina iMac. That lends it a total of 14.7 million pixels, which is almost twice that of 4K monitors (8.8 million pixels). The real advantage of working with a 5K monitor is how much room it gives you on the desktop over 4K. At 2,880p you have ample room snapping documents side-by-side or working with multiple apps on the display. It's a particularly useful resolution for video and image editors who can edit 4K media at 100% zoom while having the app's toolbars in full view. It's not so useful for gaming unless you have a monster desktop rig with two or more high-end graphics cards. If you do then you're in for a treat. Hook it up to the 275P4VYKEB using two DisplayPort cables and you'll be able to play games in glorious 5K and at 60Hz. The downside of working at the 275P4VYKEB's native resolution is that the desktop will be tiny, making it difficult to read text and generally see what you're doing unless you're sat close to the screen. Both OS X Yosemite (and El Capitan) and Windows 10 support so-called pixel doubling, which increases the clarity of text, menus, icons and images while presenting the desktop at a usable size. It's the technique that Apple employs on its Retina MacBooks to make everything appear sharp, and you can achieve the same effect on Windows by setting scaling to 200%. On a 4K monitor, this would give you the same amount of desktop space as a 1,920 x 1,080 pixel-resolution monitor. The 275P4VYKEB and other 5K monitors go one step further by giving you the equivalent space as a 2,560 x 1,440 monitor - giving you around 43% more pixels to play with. Phillips gave the 275P4VYKEB a low-key design that blends in with existing models. Its black plastic frame features a brushed aluminium pattern that contrasts with its silver round base and adjustable angular stand that lets you slide through cables to keep them tidy. A row of touch-sensitive buttons used to operate picture settings and other menus are located along the bottom right-hand side of the display's bezel. Though it's a matter of preference, I always prefer physical buttons to operate menus as they're less finicky, and it's a shame Philips hasn't opted for them on its new flagship monitor. The display is equipped with PerfectColour technology which allows it to cover 99% of the AdobeRGB colour space, according to Philips. There's also Multi View, which lets you hook up two separate devices using DisplayPort to display their contents on each half of the screen. Being high up allowed the 275P4VYKEB to demonstrate its wide vertical and horizontal viewing angles. Its stand has basic tilt and pan abilities in addition to a height adjustable stand, so you won't have to balance your expensive purchase on a pile of wobbly books. The Philips 275P4VYKEB is both flashy and not very flashy. Its design isn't really anything to shout about, but look inside the bezel and you'll find a screen that's breathtakingly sharp, bright and primed for serious productivity work. Just as 4K monitors were a few years back, 5K monitors are currently a niche luxury, but if you've got the PC to power it (and the cash), the 275P4VYKEB's excellent picture quality, array of ports, adjustable stand and other features could make it a worthy alternative to Dell's and Apple's displays.